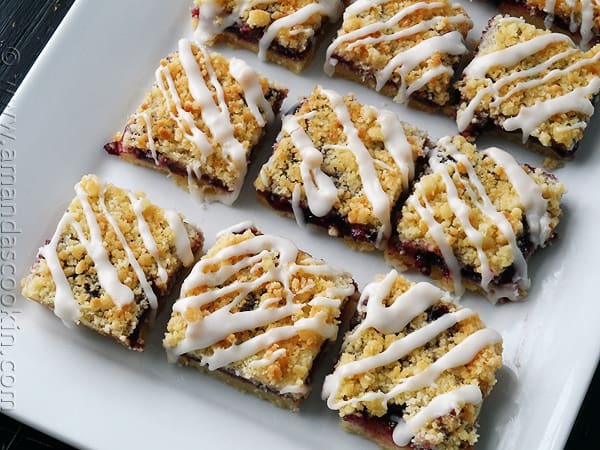 Layered with raspberry and cherry jams, sprinkled with a buttery streusel topping and drizzled with tempting glaze, these dessert bars are positively dreamy! 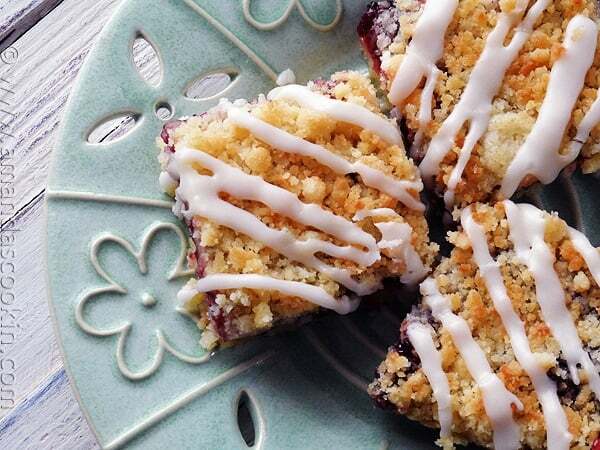 Mix things up and use your own combination of jam flavors, or stick with one if you like. I’m pretty sure these are one of my favorite dessert bars to date. I’ve always been a cherry fanatic, and raspberry is right up there in my top 5 list. These would be great with any flavor that floats your boat though. Blackberry sounds amazing as does orange marmalade! 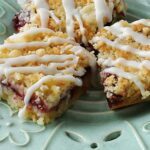 I love making dessert bars because they are so much easier than making batches of individual cookies and take a lot less time. They are totally portable, just cut them up and put them back in their original pan. They’re even great for putting into lunch boxes or placing on a plate for after school. 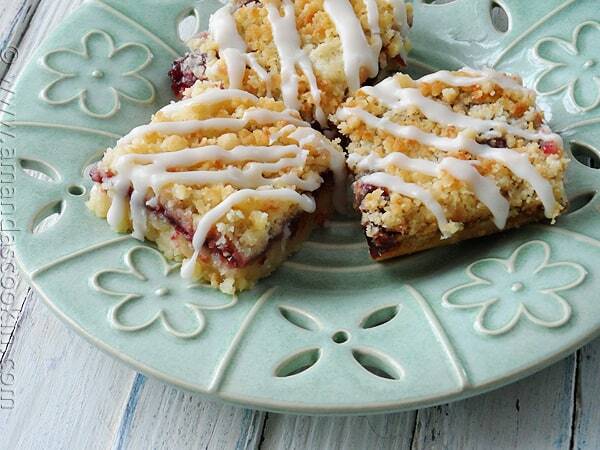 Perfect for serving with coffee or tea for when a friend stops by to chat. They’re easy to make too. Print out the recipe below for the full instructions. The basics are making the streusel and separating it. You’ll press a portion of it into a baking pan. Then you’ll add the jam and finish off by sprinkling the rest of the streusel on top. 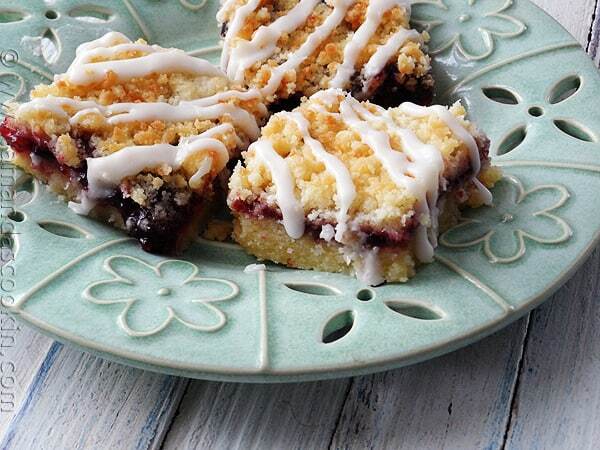 After it’s baked and cooled, cut into bars and drizzle with glaze. YUM. 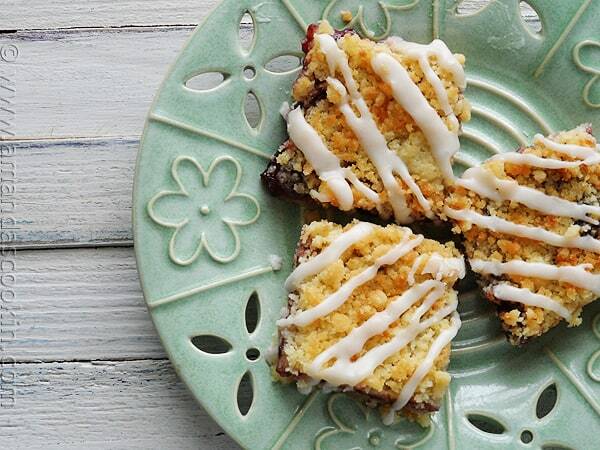 These dessert bars remind me or cookies and coffee cake combined! Preheat oven to 350 F and grease a 9x9 square baking pan. In bowl of your food processor, pulse to combine flour and sugar. Add almond extract and pulse two or three times to combine. Add butter all at once and process until coarse crumbs are formed, just as the dough begins to come together. Dump two-thirds of the crumb mixture into prepared pan and press evenly. Set remaining crumb mixture aside for the topping. Combine the two jams, stirring to break it up then spread over the crumb crust. Sprinkle remaining topping over the jam. Bake in preheated oven for 35-45 minutes or until edges are lightly browned. Remove from oven to wire rack and allow to cool completely before cutting into squares. For the glaze, add almond extract, melted butter and one tablespoon of the milk to the powdered sugar. Stir to combine and add small amounts of remaining milk, as needed, until you reach a thick drizzling consistency. 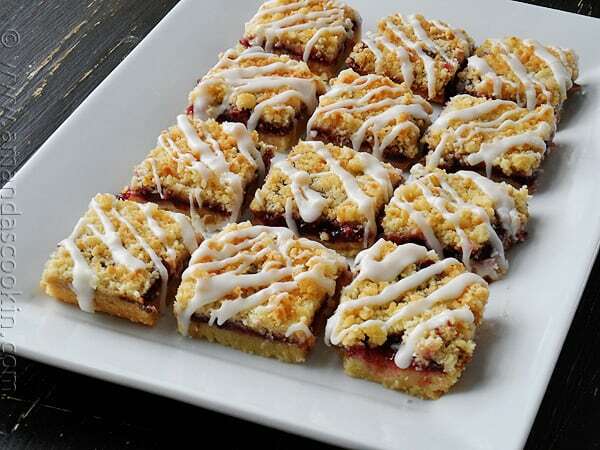 Drizzle over individual squares. Allow glaze to set before serving. Just made these and they are delicious! I boiled down some frozen mixed berries with sugar and used that instead of the jam, and used vanilla in place of the almond extract. Very good! These look amazing, just made a batch that has ten minutes left to cook, the smell in the house is mouth watering, I have converted to measurements to grams, so hopefully they work out. Such a diverse recipe, looking forward to playing with different jams. I hope they worked out Sally!